To view a map of available motorcycle spaces on campus, the Transportation Services interactive parking map contains the up to date information. Motorcycle and Moped Parking Map . 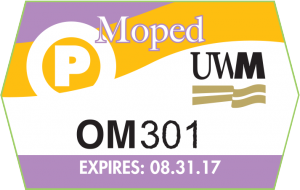 Moped operators can park at any bicycle rack on campus; with a moped permit. However, should not drive on sidewalks at any time. Mopeds are not permitted to be parked in car stalls, or in the Lubar, Pavilion or Union garages. 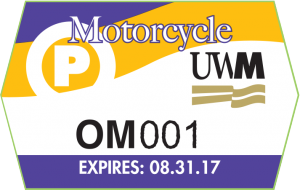 Mopeds may be parked in motorcycle stalls if the operator purchases and properly display a motorcycle permit. The associated cost for a moped permit is $50.00 annually. Permits are valid September 1st through the following August 31. The permit is prorated from the purchase date. Permits must be purchased in person at the Transportation Services office, with a license plate provided. Mopeds are defined as (1) motor vehicles incapable of speeds in excess of 30 m.p.h. of which (2) the power source is an integral part of the vehicle and whose (3) combustion engine chamber is certified by the manufacturer of not greater than 50 cubic centimeters.